A Japanese newspaper Mainichi Shinbun is one of the most popular daily newspapers in circulation in Japan. News of its green newspaper have begun to surface overseas, with many praising its efforts to preserve the natural world. 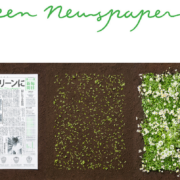 According to a 2015 Mainichi Shinbun article, the green newspaper is part of a campaign called “Mottainai” which loosely translates to “less waste.” The goal is that after reading the green newspaper, you use it to help the environment instead of throwing it away in the trash. 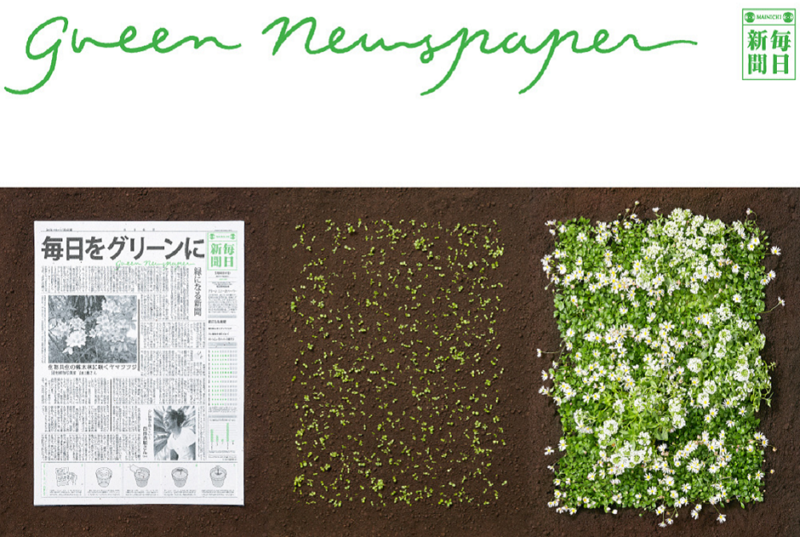 The green newspaper is made from recycled paper which contains seeds of various plants and flowers. The ink is made from vegetables, which acts as a fertilizer. The newspaper recommends tearing up the green newspaper into small pieces before planting, then voila! A beautiful garden will emerge from the recycled material. The green newspaper is not the first time that Mainichi Shinbun has made efforts to protect the natural spaces of Japan. They argue that metropolitan cities have lost their greenery and housing developments have displaced farmlands. While the Japanese government has made efforts to combat this, the newspaper says it is just not enough. Thus, Mainichi Shinbun paired up with the government to begin increasing green areas, such as forests and parks. In 2006, they began a project in which they succeeded in planting about 330,000 trees. With another project, the newspaper and government were able to plant more trees by the coastline in an effort to alleviate the strength of any incoming tsunami waves or ocean flooding. The “Mottainai” campaign is different, however, in that Mainichi Shinbun wanted the Japanese people to feel that they, too, can assist in creating more greenery in Japan. The green newspaper is produced for a special event in Tokyo on “Green Day,” where anybody can attend and collect one of these green newspapers. The green newspaper has articles that teach readers about environmental problems and solutions. After reading the newspaper, it is ready to be planted. The seeds inside the newspaper are a mixture of different plants and flowers, so that the reader will be surprised from what emerges. While the newspaper is only printed for one day a year, the impact it can have is enormous. The campaign has been successful and popular, and can hopefully grow beyond Japan in order to regrow nature in man’s domain. To learn more about this green newspaper, read this Lifegate article or watch this informative video! Air Plant Care for your WabiMoss Piece A little update from WabiMoss!